An introduction to the use of lime in building by Phil Brown. The use of building limes have increased considerably in recent years and for very good reason; these relatively simple materials are essential to the structural welfare of historic buildings, a fact that has not escaped my attention whilst working with these materials over the last seventeen years or so. While today this is much better understood in building conservation, its virtues are receiving a growing appreciation from mainstream builders and property owners, who having used them and witnessed the benefits, are willing converts to an ideal that has been understood by previous generations for over a thousand years in this country alone. Our loss of knowledge for building limes has evolved over the last hundred years for a number of reasons; without doubt the introduction of Ordinary Portland Cement (O.P.C.) had the biggest impact on the building industry. Patented in 1824 the wholesale displacement of lime for cement did not take place until the twentieth century, and only then following a series of radical events; major investment in the cement industry in the 1930’s closely linked to the defence of the nation and other military needs and requirements of World War II, followed by the subsequent rebuilding following five years of unprecedented destruction. The properties of cement had been recognised for many years prior to this period, but the economies of scale and the traditionalist nature of the building industry still favoured the more established material. However, the complete acceptance of OPC came from a lack of knowledge, from an industry that simply wouldn’t have known or appreciated at the time, the implications to a building system that had been empirically tested for more than a thousand years. Such rapid displacement resulted with an industry that had virtually lost its ability, let alone its acceptance to use any type of lime, banished by a material that is today produced on such a scale that the smaller independent lime producers of yesteryear would be in awe of. The traditional lime kilns that were scattered the length and breadth of the country were often small provincial industries producing a wide range of limes, each offering different properties dependant upon its geology along with other factors such as the kiln itself, the fuel used, even the skill of the lime burner. Here in Cornwall we have always had to rely on imported material, originally brought in by sea, and generally the purer non-hydraulic lime from Plymouth (for the South Coast) and the hydraulic limes of South Wales (for the North Coast).As well as many other sources from around the country, even abroad, dependant upon the commerce of shipping (long before the Pantechnicons of today). Discharged at any of the little ports dotted all around our shores, Cornwall had in excess of 230 lime kilns, many of which still survive intact, with all but a few accessible by sea.The demise of lime and the way it was produced was inevitable, the impact with advances from industrialisation, especially the introduction of the railways along with many other reasons, all contributed to the displacement of lime. 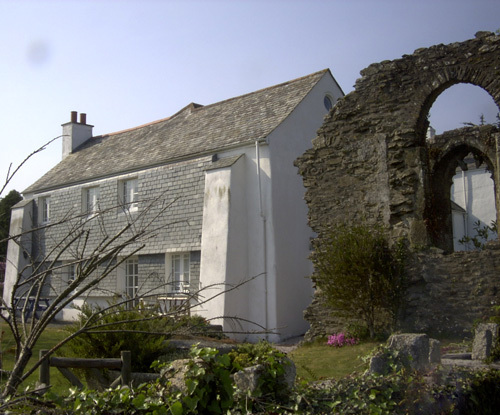 Many people still struggle to understand the role of lime in the care and repair of historic buildings. Confused and often bewildered by the many conflicting reports and views expressed it is hardly surprising there is reluctance to make use of this ‘mysterious’ product. I am aware of examples where masonry has been built with a cement mortar then pointed with a lime mortar in the belief that it’s the lime pointing that’s beneficial. Lime should not be, and is not, complicated. It is a relatively simple material that like the materials in most building jobs simply demands adequate preparation and proper curing. Put another way “all limes require babysitting in their infancy.” Where builders have experienced failures is usually down to poor site practice - a simple issue to resolve. 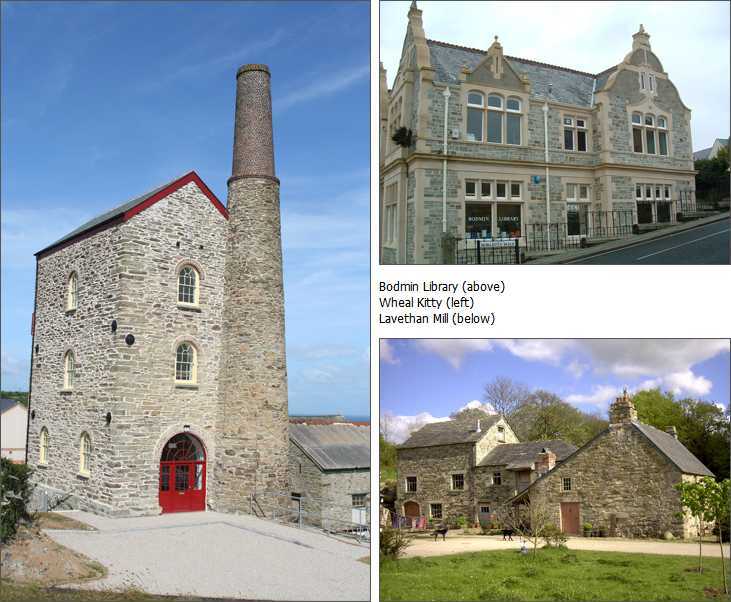 In 2005 Cornish Lime Company opened a brand new, purpose built facility to offer training in the many aspects of “Building Conservation”. It has always been our intention to freely provide good quality information to our customers, it is after all how we make our living, and what benefit is there in seeing people having to jump through the same hoops that we’ve had to in order to look after the unique built heritage of both this County and the region more generally. 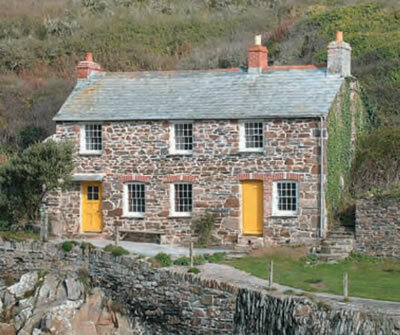 Traditionally constructed buildings used materials such as stone, brick, or cob in conjunction with permeable lime mortars and renders (when and if they could be afforded) to rely on keeping out the weather. The way in which these mortars work is through their ability to absorb and release moisture – “breathe” and accept structural movement. Builders realised that by managing these phenomenons, rather than altering them, moisture could be kept under control in the vast majority of cases. Traditional mortars are porous and their ability to allow buildings to breathe must not be altered by the application of modern compounds such as silicones and the like. Cements are the biggest single cause of dampness contributing to the decay that many old buildings are subjected to. 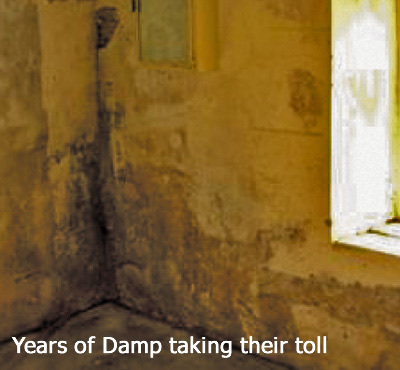 From my own experiences, at least 99% of the problems I have dealt with involving damp in older buildings will be down to the use of cement or modern paints. All too often the advice we offer is ‘too late', with expensive works having already been carried out. The old adage of "there never being enough time to do it properly, but always time to do it twice" ringing in my ears. Composite masonry walls of the type we refer to here have evolved over time to a thickness of 600mm (in general terms the wider the wall the older the building), which has been found to be the optimum thickness to keep the weather at bay and buildings dry. Whilst the primary function of the mortar is to keep weather out and another reason for good, regular maintenance, the masonry can’t be said to be waterproof, by virtue of its composition and/or the type of masonry units used it’s inevitable that some moisture will be absorbed into the masonry, hence the importance for allowing the wall to breathe and the main reason for using lime. All too often in repair works there is an argument for strength, which itself, is very ‘weak’ when it comes to the care and repair of pre 20th Century buildings, and should rarely if ever, be an issue. 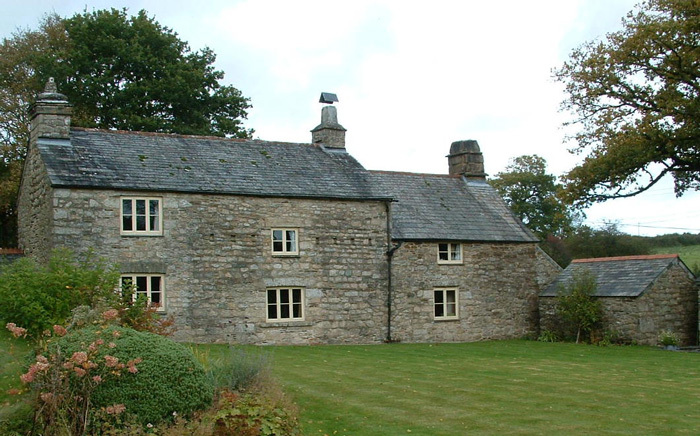 Lime is much weaker than cement and given that the majority of traditional buildings in Cornwall are built using earth mortar, lime is without doubt the most appropriate material, and the only one that could be described as fit for purpose in this type of application. Lime mortars are also extremely vapour permeable, which is the key aspect to their success in composite masonry, as it is this phenomenon that prevents damp, simply by allowing any moisture in the masonry to be given up as vapour. Cement mortars often demonstrate the opposite behaviour; being very dense and much less porous it can trap moisture within the fabric holding it captive within the soft permeable core of traditionally built structures. This phenomenon can be further compounded, as cement mortars are much denser and more brittle, and when used on weaker substrates the issue of compatibility is manifested through cracking from surface tension as a function of the poor coefficient of strength between the materials, resulting in additional moisture ingress through capillary action. Any such increase in moisture reduces the thermal performance of the wall and accelerates deterioration, encouraging the development of timber decay and other moisture related problems. Not withstanding all the other problems that cements create as a result of their chemical properties from introducing elements totally alien to the original fabric. Concentration of moisture absorption and evaporation in the stone immediately adjacent to the mortar joints (cement mortars hold moisture captive). The most effective way to care and repair old building fabric is with lime mortars using "no cement whatsoever". Over the last ten years or so there has been ample research carried out on this issue in both the UK and throughout Europe, certainly enough to convince most people involved in building conservation that there really is no justifiable cause to use 'any' cement whatsoever. We are still, essentially a nation of cement practitioners who had all but forgotten how to use traditional materials, albeit appreciate them. Non Hydraulic Lime (Lime Putty) was the most common form of lime used in building throughout history but it must be pointed out that the lime we use today differs greatly from lime used by our forefathers. 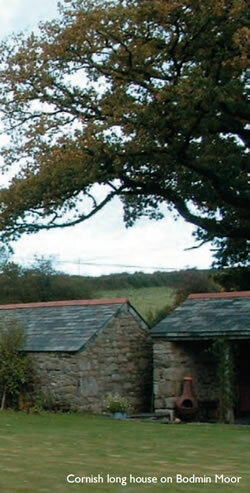 Lime burning was carried out in more than 230 lime kilns in Cornwall alone, using a range of fuel, whereas today the lime is extracted from just a few quarries that use modern gas fired, thermally efficient kilns producing a material that is just so much purer than that used historically and a point that must be taken into account today. Over the years we have produced countless tonnes of lime putty for many differing applications, yet we must understand that lime putty was a material used for the most part by plasterers. Builders used lime and produced mortars very differently to that of plasterers, a fact that is rarely considered when considering the choice of binder. Lime Putty (Non Hydraulic Lime) sets through carbonation, which is the process of reabsorbing CO2, which was burnt off during its time in the kiln.The carbonation phase, whilst the most important is probably the least understood and the reason behind the statement that all limes need babysitting in their infancy – the curing process. The properties of Hydraulic Limes have been known about for many years and exploited by countless generations of professionals and practitioners. The earliest documented work, worthy of note, is from the work of John Smeaton in the 1750’s, for the construction of the Eddystone lighthouse lying some 20 miles off the South Devon coast at Plymouth. The french engineer Louis Vicat is credited with the classification of hydraulic limes in the early part of the Nineteenth Century; by which they are often still referred to as; feeble, moderate and eminent - weak, medium and strong. Hydraulic Lime mortars, offer many "essential" advantages over the use of cement mortars, no more so than for renders, but by no means limited to this aspect alone. Being much softer than cement once fully set, they still offer similar physical characteristics to that of cement, with all the virtues of lime. Their properties more than justify their use in contemporary applications, where 'high' strength is seldom needed, yet adequate strength is essential. Hydraulic lime mortars provide this and much more besides. The classification of hydraulic limes is central to their performance and specification. Specific properties of lime will be dependent on their individual geological composition, and/or manufacture. It is therefore vital to know them without needing a degree in chemistry in order to understand them or their individual characteristics. I am not advocating the exclusive use of hydraulic limes over non-hydraulic limes, as this would indeed be misguided and rather naive, as non-hydraulic limes are often the most appropriate medium for softer masonry materials and many other aspects of use. It is more a question of its function, with specific regard to exposure, and the materials suitability of purpose.Where there is high exposure then the use of a hydraulic lime should without doubt be considered. Carbon dioxide expelled from the stone during kilning is reabsorbed during carbonation of the mortar – depending on the lime type. Being 'weaker' they allow the re-use of salvageable materials such as brick and stone (a subject worthy of its own technical paper). Lime is produced using much less energy than cement. Non hydraulic (Lime Putty) mortars have been the predominant mortars used on historic building fabric, however, their modern equivalent will not be the same as that produced from traditional kilns. Lime produced today is made primarily for the chemical industry and will have completely different characteristics to the Lime produced historically. Traditional lime would have been produced in a completely different fashion. Even the use of pozzolans, whilst offering advantages will not provide total solutions to every requirement. Exposures such as chimneys, copings, wall tops and other such vulnerable locations demand a more durable material, pozzolans can add to both confusion and cost, whilst trying to mimic the qualities of proven hydraulic materials. Lime putty mortars have other limitations, especially during frost prone months, when it should not be used externally, or where at all vulnerable to this element.They can be temperamental, requiring knowledgeable and sympathetic specifiers, contractors and above all clients. These are but two of the drawbacks for fat limes, however, anyone used to working with fat limes for renders or mortars will favour their improved working properties over those of hydraulic limes every time. 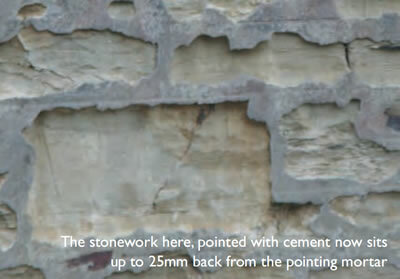 Hydraulic Lime: After many years of working with both fat lime and hydraulic lime, I am very comfortable with the use of these materials, especially the St.Astier ranges of hydraulic limes and have yet to arrive at a situation or application that one of the three grades cannot meet. After many years of manufacturing quality lime putty, I find it increasingly harder to recommend lime putty to the trade, in the simple knowledge that it will be out performed by an ‘appropriate’ St.Astier material. The introduction of the St.Astier materials into the Cornish Lime Company's product range is an arrangement that I am very happy to accommodate. St.Astier is a pure and natural material from a company totally committed to quality, with technical support and literature second to none, and a pedigree in manufacturing hydraulic lime from the same site, continuously, since 1851. A place I have visited many times with countless professionals from the industry, to a company without covert manufacturing procedures and one only too pleased to demonstrate their processes and commitment to quality. My background as that of a mason with years of practical experience owning and managing a building business over many years here in Cornwall. This puts the Cornish Lime Company in a very good position to offer valuable help and assistance to our clients as required. We are happy to discuss even visit sites, where appropriate, in order to evaluate and assist specifiers and clients in preparing specifications, for both the technical and practical suitability of these materials. For further advice or specific technical data sheets on the many aspects only touched on here, please Contact me or the team at the Cornish Lime Company or visit the St.Astier Web Site. Phil Brown - Cornish Lime Company. Revised May 2008.